Hot sale now on and subject to first come first served basis. Spanish Version Pump It Up PRIME 2015 HDD 2 Upgrade Kit is the latest release from Andamiro in addition to their hugely popular music and dance series, Pump It Up. The Pump It Up 2015 Upgrade Kit has a number of amazing new features for current players to enjoy and for new players to discover. 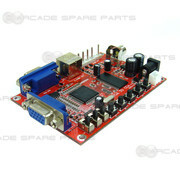 The VGA to RGB CGA video Converter can convert a VGA signal to CGA signal. This allows you to play high resolution 31k arcade games on a CGA CRT monitor (15k) or any TV monitor (using AV/RCA or svideo connection, can accept both PAL and NTSC outout). You can also use the VGA input of the Converter to play PC games on a CGA CRT / TV Monitor. Mice head made of durable and tough plastic . It is suitable for Mice & Cat Hammer Machine, and similar amusement machines. Drum Mania Drum Pad suitable to replace the rubber drum pads on Konami Drum Mania and Percussion Freaks arcade machines. The drum pad is made from durable silica gel and includes a shock absorber. The drum pad is suitable to replace the Snare Drum, Hi Tom, and Low Tom rubber pads. WCCF Player Cards 05-06 Starter Pack contains everything a player needs to start playing World Club Champion Football. Each starter pack includes 1 IC Card, 11 Player Cards, and 11 Plastic Card Sleeves. Naomi Motherboard plus plus Derby Owners Club 2000 Ver. 2 Cartridge. The Sega NAOMI motherboard is based on the same system-architecture as the Sega Dreamcast. Included is Derby Owners Club 2000 Ver. 2 Sega Naomi Cartridge - a horse racing simulator which involves raising a horse, training the horse, and racing the horse. Naomi Motherboard plus Sega Tetris Cartridge. The Sega NAOMI motherboard is based on the same system-architecture as the Sega Dreamcast. 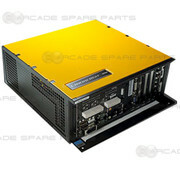 The NAOMI motherboard uses a Hitachi SH-4 CPU, PowerVR Series 2 GPU and a Yamaha AICA based sound system. Included is Sega's adaptation of the classic Tetris, featuring spiffed-up graphics and your typical Tetris gameplay. Sega STV Motherboard plus Die Hard Arcade STV Cartridge. Die Hard Arcade is the licensed American/European version of the Japanese videogame Dynamite Deka. The game is a side scrolling beat-em-up that, with players battling through waves of enemies with various weapons. Big Buck Hunter: Call of the Wild is one of the sequel of the well-known hunting game, Big Buck Hunter. It operates on a single gun platform and allowed four players to compete round robin style through various treks and bonus stages. This Coin Timer Box controls the time of power supply for electronic devices, such as, television, massage chair, kiosk system, water dispenser and washing machine based on the number of coins the user insert. It is setup for Australian coins. 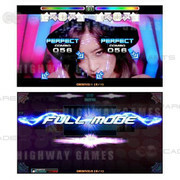 Pop n Music 20: Fantasia arcade game board is a game in the Pop n Music series of video games from Konami. Namco NBLine VPN Router is a dedicated router for Tekken Tag Tournament 2. This Namco NBLine VPN Router can be used to connect most Namco games such as Maximum Tune 4, Dark Escape, Mario Kart Arcade GP DX, Ace Angler, Tekken Tag Tournament 2 PCB to Namco Bandai server for daily operation and update. Ocean King 2 : Monster's Revenge PCB Upgrade kit is a video redemption arcade game kit perfect for updating or refurbishing your old Ocean King or fish hunting cabinet. The Ocean Star 3 PCB Upgrade Kit support 4, 6, and 8 player video redemption arcade cabinets and is perfect for customers looking to upgrade their old fish hunting cabinets. The Seafood Paradise 2 Arcade Game Board features with a ocean theme, similar to fish hunter game and allows 6 to 8 players to play at the same time. It is incredibly popular in most arcade centers! The Legend of Dragon King Arcade Gameboard Kit is great for customers who want to upgrade their old 6 or 8 player fish hunter or ocean king cabinets.